All the best free crochet patterns. This beautiful coat is very easy to make. It is entirely worked in double crochet. 4 mm wool and 3.5 hook were used in the video tutorial and example size is 4 T, but there are adjustments shown for sizes from 1 to 5 years. The video is very clear, spoken in English and detailed. The pattern is displayed on the screen automaticly. Share your final work with our facebook group! This amazing tutorial is here. 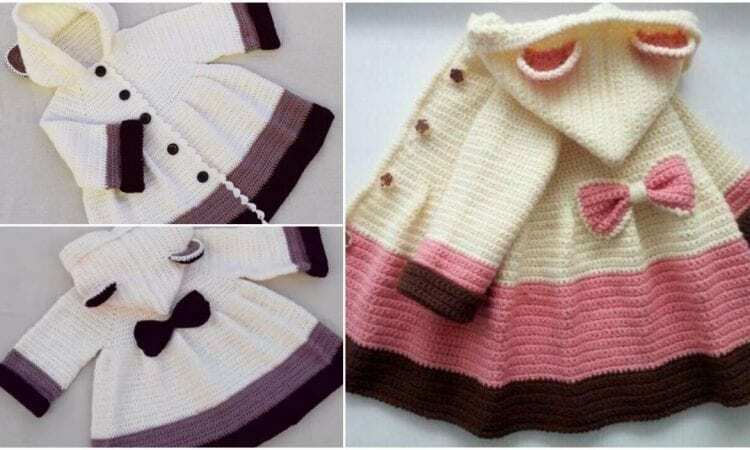 I have tried several times to download the free tutorial and pattern for the little girl’s double crocheted coat with a hood and a bow on the back. I have save it to pinterest….entered my email….an d clicked on everything I could. Could you please let me know the secret on downloading this FREE pattern. Sorry, there is no pattern to download, pattern is displayed on the screen when watching the video. where is the video. I found a link and it takes me back to Pinterest. Thank you for your massage, video is at the end of the post. It’s on majorly English YouTube page. I have also tried to find video of this coat many times, with no luck whatsoever. I have tried all the ways suggested above and this does not work as posted. I cannot get the video to come up as described. I have clicked on the picture , the click here space and nothing happens juts goes back to the same picture. I love this pattern and would love to make it. Thank you for your help. Very good video, only problem there was no audio in some parts Very easy to follow. So apparently there is no video either, the link just takes you in a circle. OK… I’ve had the same problem. How do you get to the video? All I get no matter what I click on is the pictures of the coat. ?????????? I saw this pattern on YouTube in spanish. I’m so happy someone translated it to English. The only problem is : where is the link to show the video? Is this on YouTube? Thank you, video is at the end of the post. Do you have a written pattern for this beautiful coat:? 1. Look under last photo. “This amazing tutorial is here”. 4. Click on the word “here”. 5. You will be redirected to a YouTube video. Hi. Could you tell me how many stitches to start a size 2 coat please? I’m learning how to read and follow patterns and whilst this tutoral is great I an struggling with knowing how many chains to start with for the other sizes.